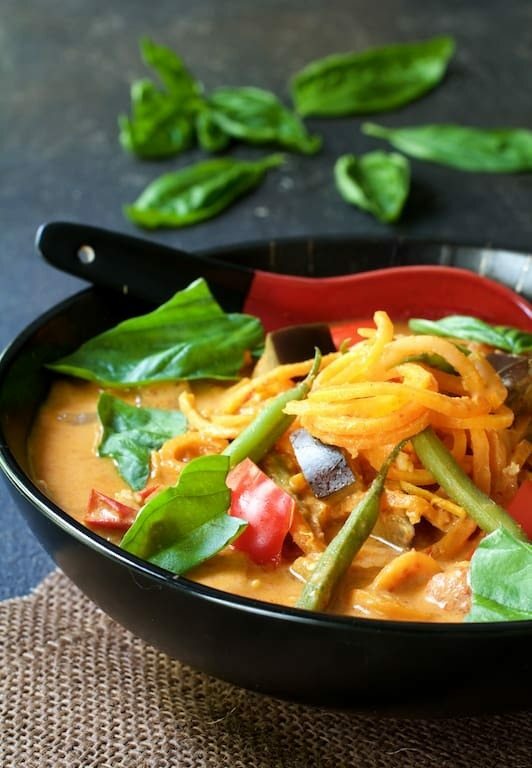 Vegetables in Thai Red Curry with Sweet Potato Noodles is spicy, healthful comfort food any time you need a shot of goodness! Heat oil in a large skillet or saute pan over medium-high heat. Add the onion, reduce heat to medium and cook 4 to 5 minutes or until it begins to soften, adjusting heat as necessary so the onion doesn't brown. Add the red bell pepper and green beans. Cook 2 to 3 minutes or until green beans deepen in color. Add the eggplant and garlic; cook 1 minute or until garlic is fragrant. Add tomatoes, sweet potatoes, coconut milk, vegetable broth and red curry paste. Bring to a boil, reduce heat to low, cover and simmer approximately 20 to 25 minutes or until eggplant and sweet potatoes are tender. Add lime juice and fish sauce, soy sauce or coconut aminos. Stir in basil. Serve in bowls. Garnish with additional fresh basil.